Read intimate stories and thoughtful musings on parenthood after infertility in our picks of the top infertility, donor conception, surrogacy, and adoption blogs. Two Moms Make a Right: As Aela and her wife, Sara, know all too well, the journey to motherhood can be filled with twists and turns. Aela had been trying to get pregnant for three years, but after countless home inseminations, IVF, FET, and IUI cycles, and a devastating loss of twins at 17 weeks, the couple decided that Sara would try. When life threw them for another loop and Sara miscarried at 12 weeks, the couple once again changed course. Now both women are trying to get pregnant at the same time! Follow along on their blog and on Babble.com. Stirrup Queens: This blogger, editor, fiction and non-fiction writer, and self-proclaimed “infertile” speaks candidly about navigating the emotional challenges of infertility and conceiving her twins, “ChickieNob” and “Wolvog,” through fertility treatments. She also maintains an ALI (adoption/loss/infertility) blogroll that currently numbers more than 1,800 blogs. A Little Pregnant: This mama’s snarky sense of humor will keep you laughing, even through the trials and tribulations of multiple IVF treatments, an ectopic pregnancy, IUIs, and (finally) the birth of her son. You won’t be able to stop reading this one. Bio Girl: Blogging for more than seven years, Bio Girl (Sarah) documented her family’s growth from two to three after years of endometriosis and infertility struggles. Today, this mama of one has come to terms with the fact that she will not be having any more children and is enjoying life with her husband and son. A Chick and Eggs: After years of infertility and unsuccessful IVF treatments, Chick recently gave birth to a baby girl with the help of an egg donor. Read this mom’s honest, no-nonsense blog as she chronicles infertility, IVF treatments, choosing an egg donor, pregnancy, and now motherhood. All In One Basket: August and her husband turned to donor egg after learning that she had ovarian failure. After a round of altruistic egg donation ended in miscarriage, the Canadian couple did donor egg IVF in the U.S. Her daughter, “Gummy Girl,” is now a toddler. Donor Eggs Journey: After five unsuccessful IVF cycles and other fertility treatments, Journey Girl traveled to Thailand for a donor egg transfer. Two years later she did it again, and she now has a preschooler and an infant. Read about the Australian mum’s decision to use donor eggs, and follow with her as she embraces the challenges parenting brings. Finding My New Normal: After struggling with infertility for seven years, this mama shares the emotional journey following the loss of her son at 36 weeks pregnant. Currently pregnant with her second child through donor eggs, she continues to search for normalcy after loss. My Lazy Ovaries: This heartfelt blog chronicles the difficult path to motherhood after age 40. After four years trying to conceive with “lazy ovaries,” Slackie and her husband Prof recently welcomed a baby boy into the world with the help of donor eggs. Roccie Road: At 42, Roccie is the mother of an IVF toddler, a donor egg baby, and is now pregnant with a “surprise” baby conceived without intervention. She also found a wonderful family to accept her remaining embryos – and they are pregnant on their first try! The Other Side: Kami and her husband Brad are on the other side at last. After coping with a neonatal death, two miscarriages, multiple IUIs and IVF cycles, they are now the proud parents of two daughters via donor eggs. Knocked Up By Another Man: Military wife turned mother with the help of an egg donor, this mama and her husband are now trying for baby number two with an embryo donation. A Greater Yes: Jess and her husband are self-proclaimed “infertility veterans.” It took them 12 years, four IUIs, two failed adoptions, and one round of FET with donated embryos to have their daughter Madison. Conceiving baby number two proved to be just as challenging, but they are pregnant again. The Road Less Traveled: This blog chronicles a couple’s journey through infertility, infant loss, embryo donation, and now parenthood. Rebecca and her husband are now expecting their second child through embryo donation. Chasing a Child: After doing the infertility rounds, the author and her husband adopted domestically. Read her infectious, amusing posts about parenting a very active little boy (dubbed “Squeaker” on her blog) and reestablishing birth mother contact after nearly two years. She had her second child, via frozen embryo transfer, two years later, at age 45. Creating Motherhood: Dresden started her blog to chronicle the journey of becoming a single mother by choice via anonymous donor sperm. She has one son, W, who has always known about his unique conception. Dresden has tried to become pregnant twice since having her son, but sadly, both pregnancies have ended in loss. Her honest look at single motherhood will have you captivated. The Question Now Becomes: Due to an endocrine disorder, her husband knew from a young age that he would never become a biological father, but that hasn’t stopped this UK couple from starting a family. Three cycles of IUI with donor sperm later, the couple now has twins! Mama C and the Boys: Mama C became a single mother through domestic, open adoption and donor insemination. For a period she “co-parented” her two sons with her oldest brother, who lived upstairs. Now she’s preparing to get married and getting used to the idea of being a family of four. Amani and Bob’s Indian Surrogacy: Meg and Bob are the proud parents to two children through surrogacy. Meg is now an independent facilitator for surrogacy in India and Mexico. What started as a parenting blog to chronicle their surrogacy journey, now serves as a platform to share up-to-date information on international surrogacy. Family Building with a Twist: KeAnne blogged her way through infertility, gestational surrogac,y and now motherhood. There is never a dull moment with her hubby, preschooler, and three cats. MRKH Musings: Born with a rare condition called Mayer-Rokitansky-Küster-Hauser (MRKH) which affects the female reproductive system, Arwen started to blog as a form of therapy to cope with her diagnosis and infertility. Follow along as Arwen and her husband Dax document their journey to parenthood through gestational surrogacy. Spawn of Mike and Mike: “The Mikes” are a gay married couple that has been together nearly 20 years. Now the daddies to Rose and Eva, their joint blog chronicles their journey to having kids through surrogacy in India. The Rasta Less Traveled: It took eight donor egg cycles, seven transfers, six miscarriages, five REs, four gestational carriers, three egg donors, and two countries before this determined couple became parents. Bernadette and Duane welcomed twin babies, a boy and a girl, into their family with the help of a surrogate in India. Sadly, the couple lost their little boy to a rare form of epilepsy just shy of the twins’ first birthday. Their blog serves as a celebration of life and parenthood. White Sugar, Brown Sugar: Rachel’s adoption journey began nine years ago when she was diagnosed with type 1 diabetes. Once she learned the risks of becoming pregnant with her condition, she knew she would adopt. Today, Rachel and her husband have three transracially-adopted children through open, domestic adoptions. Rachel has writes about raising her “brown sugar” and the bittersweet reality of adoption. Improv Mom: Barbara embraces the challenges of adoption and joys of parenthood with a grain of salt and a sense of humor. Barbara and her husband Tony adopted their daughter Beth as a newborn through an open adoption. Her blog can be found on Adoptive Families Circle. Familia Means Family: Gaby blogs about life with a multilingual, multiracial, and multicultural family on Adoptive Families Circle. She and her husband adopted two children domestically as infants through a closed adoption. My Three Sons: Samantha Hines is the wise parent we all strive to be. She writes with humor and grace about parenting three inquisitive, active, big-hearted boys through domestic, infant adoption. Lavender Luz: When Lori, a mother of two, started blogging, her family had a very open relationship with her daughter’s first mother. Now, all four birth parents are a regular part of their lives. Must-reads include her compelling accounts of post-adoption depression and the reunion with her daughter’s first father. Letters to a Birthmother: M. began her blog in 2007 as a way of “sending” notes to the birth mother they weren’t in close contact with. Since then, their adoption has become fully open, and her blog chronicles the everyday ups and downs of parenting her son, “Woob,” in an open adoption. An Infertile Blonde: Becky Fawcett went through five IVF cycles, had two miscarriages, and spent thousands of dollars trying to conceive before adopting domestically. Her posts range from heartfelt confessionals about infertility and waiting to self-deprecating observations about aging to giddy celebrations of life with her two children. Fawcett and her husband founded the grant-making organization helpusadopt.org. Life from Here: Musings from the Edge: Launched as an online journal to cope with infertility and the loss of a baby halfway to term, the blog has turned into the documentation of one family’s efforts to build their family through open domestic adoption and the joys of parenting through adoption and a surprise pregnancy at age 42. Production Not Reproduction: Heather Schade is a parent to three young children through open, domestic adoption and is the founder and caretaker of Open Adoption Bloggers, a network of writers from all sides of adoption. From IF to When: In her now completed blog, Katie blogged every step of her journey throughout infertility and adoption. Her new blog, No Ways to Say It, chronicles her journey through parenting and life. Our Family Grows with Love: As both an adoptee and an adoptive mother, Sharon knows both sides of adoption. When it came time to start her own family, Sharon and her husband Mike knew they wanted to adopt. Now a family of three, Sharon firmly believes that adoption is the greatest gift in the world. This heartfelt blog can be found on Adoptive Families Circle. Our Journey to Adopt You: Madeleine was adopted from foster care as a toddler and is mother to three children through adoption. She frequently shares her unique perspective on tough topics like foster care, birth parents, and adoption ethics – but always with grace and the disclaimer that they are her thoughts, and hers alone. Madeleine’s beautifully crafted posts often remind readers that each adoption is different, and each adoptee has the right to process adoption their own way. Joyful Journey Mom: Jenni and her husband have five children, three through adoption from Ghana. What started off as an adoption journal, has since morphed into a parenting blog with a focus on special needs, adoption, and life as a transracial, multicultural family of advocates. Jenni’s beautifully written posts will inspire and give you hope. Man Up! : This papa shares what two international adoptions (India and China) have taught him about fatherhood, parenting, and himself. Jeff’s daddy blog can be found on Adoptive Families Circle. Melting Pot Family: Ellenore’s melting pot family is made up of a Greek husband, two biological sons, and a daughter, Leyla, adopted from Ethiopia. Her blog on Adoptive Families Circle gives a candid view into the many emotions of adoption: pain, loss, and most important, joy. Be Bold Or Go Home: Life may be challenging, but it’s never dull for Sharon and her three children, adopted from India and Ethiopia. 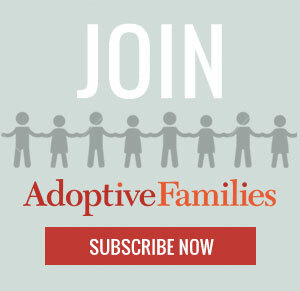 Read her thoughtful blog on Adoptive Families Circle. Our Little Tongginator: A Southern mama shares funny, honest stories about raising two smart, feisty (albeit, very different) girls adopted from China. When Rain Hurts: This powerful blog turned book follows one mother’s quest to find a magical path of healing and forgiveness for her adoptive son, a boy damaged by Fetal Alcohol Syndrome and the rigors of a Russian orphanage. They’re All My Own (Ethiopia): When Alison and Kurt’s daughters were in their late teens, the couple adopted two boys from Ethiopia. Alison’s unique perspective—she’s a mother by birth and by international adoption and an adult adoptee—comes through in many posts. Rage Against the Minivan (U.S. Foster & Haiti): From the title to the photos to the posts, Kristen’s blog is entertaining and thought-provoking. Her unique voice comes through in posts about letting her boys dress up as girls, taking a trip to visit her son’s orphanage “brother,” and, yes, ranting about (and ultimately giving in to) the iconic minivan. Phase Three of Life: A self-described “master compartmentalizer,” Meghan has divided her life thus far into: Phase one — childhood through college, Phase Two — early career, wedding, and pregnancy, and Phase Three — her current stint as a freelance writer and stay-at-home mom raising her 4-year-old biological son and 3-year-old foster son. Meghan also writes the “Foster Parent Diary” for The New York Times’s Motherlode blog. Fosterhood: Rebecca is an adoptee leading a new breed of “smart, young foster parents.” Her blog is filled with no-nonsense anecdotes about life as a single mother in NYC raising two 2-year-old girls. Since starting her blog, Rebecca has taken care of five foster care babies, one of whom she’s adopted and another whom she’s in the process of adopting. Foster Adoption Blog: Minnie, an adoptee turned foster, biological, and adoptive mother, shares her family’s journey to adopt a sibling group through the U.S. foster care system, in pursuit of their “happily ever after.” Her well-written blog chronicles the ups and downs of the foster to adopt process. The Declassified Adoptee: Amanda, adopted in the U.S. when closed adoptions were the norm, is a passionate advocate for adoptee rights. She reads and researches extensively, and her articulate posts are peppered with footnotes, statistics, and relevant quotes. In 2011, Amanda founded Lost Daughters, a blog network to share the perspectives and narratives of adopted women. The Adopted Life: Angela Tucker is a trans-racial adoptee adopted from foster care. She is a writer and speaker for adoption, as well as the subject of the documentary Closure, which chronicles her search for her birth mother and meetings with many birth family members. Her blog tells the story of identity and the complexities of trans-racial adoption. Diary of a Not-So-Angry Asian Adoptee: Christina is a Korean adoptee who was adopted at the age of two. Her husband is of Mexican descent and she is the mother of two children. As an adoption advocate, her blog is about giving a voice to adoptees. She writes about things that make her hurt, things that make her smile, and everything in between. Amstel Life: When Amy became pregnant her senior year of high school, she initially dreamed of parenting the child with her high school sweetheart. But when the young couple met prospective parents De and Don and learned about open adoption, they knew that was the path for them. Ten years later, Amy is newly married, expecting a child of her own, and still maintains a close relationship with her daughter, Deanna, and her loving parents, De and Don. The Happiest Sad: Jill started blogging in 2009 when she decided to place her nine-week-old daughter, Roo, for adoption. Five years later, her blog continues to tell the story of open adoption and her relationship with Roo and Roo’s adoptive parents. The Modern Mom: This touching blog documents a birth mother’s journey through motherhood after making an adoption plan more than 10 years ago. Bona Fide Birth Mother: As a birth mother and blogger with Asperger’s Syndrome, Stephanie is very open about her decision to relinquish daughter Lady-Bug and son Sweet-Sesame for adoption. Her love for her children and the complexity of her decision shines through every post in this moving blog.